1. Took a trip to hospital with Mia (again! )....she got something in her eye before bed Saturday night and woke up extremely miserable and swollen Sunday morning....after a torturous few moments of doc poking and prodding and squirting hurty stuff in her eye while I held open the eyelids (isn't it fun being a mother? )....we were told there was nothing in there and sent home. You have to be a teensy bit dubious esp after our last episode when the doc tried to send us away...."that arm is definitely not broken"....yeah right. 4. Surprised myself by losing another little bit of weight this week, despite that piece of caramel slice! 5. Contemplated trying out for this.....what an awesome opportunity it would be! 6. Got caught up in that rush of nerves and excitement bidding (and winning) this multimedia dvd/tv/cd on eBay.....it will be the kid's Easter pressie and handy for those rainy camping days....cool! 7. Had a Yahtzee tournament with the kids, followed by a Fooseball challenge....fun! 8. Sat in the car reading my book for a blissful hour while Kate and her friend had their clarinet lesson....the sounds drifting out to the carpark were just gorgeous - those girls are really improving! 9. Had a loooong phonecall with Mum....love those....you know the kind where your ear is aching and the handset is burning hot by the end? 10. Tried not to go outside or look out the window while two of our beautiful steers were being - how shall I say - prepared for the freezer. 11. Delved into the far reaches of my wardrobe.....tried everything on.....made up a big garbo bag full for Vinnies and one for the bin......and rediscovered a few long lost friends lurking up the back. What did you get up to??? Hope Mia's eye is better, poor little thing! 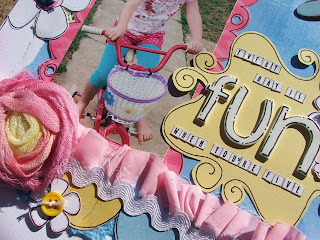 Love the sneak peek at the LO, that pink ribbon and the gorgeous flower look super. The Xmas LO made me a bit sad that I didn't get to share the hols with you all. I am missing girly cuddles! You should definately go for the Kim Archer support person job!! It is just up your alley, I think. 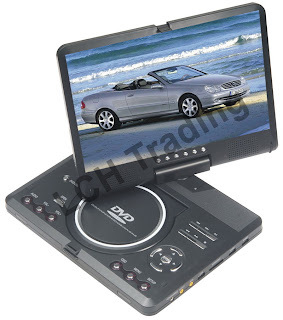 Super DVD player, fun for the holidays and long car trips. Our little animals came back to us in plastic bags on Friday, so no need to hide behind the curtains here! Dontcha hate that! I loved the long phonecall too....should be more of it! Penny!!! Don't chuck your clothes out til I get to see them!!!!!!!!! See number 5.... try out for it. you would rock it.